Stay tuned for details coming Fall 2019. 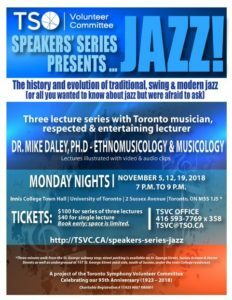 CLICK HERE to Purchase Tickets for the 2018 event Speakers’ Series presents JAZZ! Book early: space is limited. By Phone – Call 416.593.7769 X 358. Please leave a detailed message with your name and phone number, and one of our event committee members will contact you. By Mail – Download/print the Speakers’ Series 2018 – Reservation Form and mail to: Toronto Symphony Volunteer Committee, 500-145 Wellington St. W., Toronto, ON M5J 1H8. Please provide the full name(s) of your guest(s). If payment by credit card, one of our event committee members will contact you to arrange payment. If payment by cheque, please make cheque payable to the "Toronto Symphony Volunteer Committee" and send to: TSVC, 500-145 Wellington St. W., Toronto, ON, M5J 1H8. A Look Back at Our 2017 Speaker Night event! Funds raised by the TSVC are used to support the TSO’s school and community programs, as well as the Toronto Symphony Youth Orchestra (TSYO). The TSYO is one of Canada’s largest youth orchestras, and for more than 40 years has been dedicated to providing a high-level orchestral experience for talented young people aged 22 and under. 2015-2016 marks the first season that the TSO will offer tuition-free enrollment to all TSYO members on a scholarship. The TSVC is committed to supporting the TSYO and eliminating the financial barriers for talented young people.